London is a unique city in the way you can enjoy a little bit of everything. In the middle of one of the busiest cities in the world you can also enjoy everything the countryside has to offer. A group of young girls were saddling up and about to set of for their riding lesson. 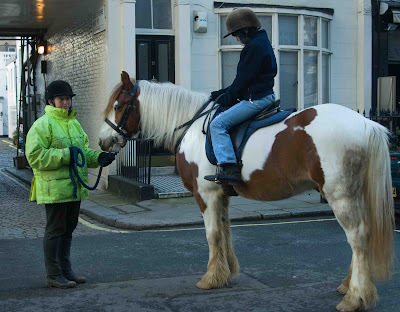 Hyde Park Stables is just across the road from the park where there are 5 miles of riding paths. You may be looking here at a future Olympic equestrian. Your previous photo is just awesome! I love all the contrasts of London! It is amazing that is such a varied city. The perfect host for 2012! I rode horses when I was very young and younger but I felt twice. This horse is very beautiful. I love horseback riding! Haven't done that since high school! Would love to do that in England sometime!